Belize City, Belize – April 28, 2016 – Yesterday, April 27, Belize welcomed the Norwegian Getaway in its first call to Belize. The ship arrived with 4,360 passengers as it arrived in port at double occupancy. The customary plaque exchange ceremony took place on-board the ship between the Belize Tourism Board (BTB) and Captain Rune Myre of the Norwegian Getaway. 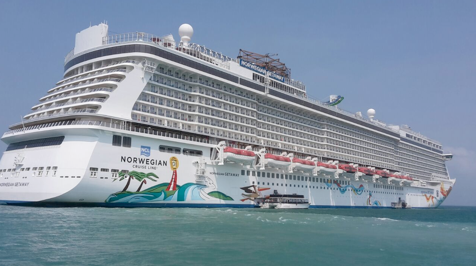 Miami’s Ultimate ship, the Norwegian Getaway combines the most magnificent amenities Norwegian has to offer with The Waterfront, an innovative, industry-first open-air promenade designed to connect guests with the ocean like no other cruise line. It hosts twenty eight (28) dining options, five water slides, and three levels of action-packed activities in the sports complex. The excitement and entertainment continues with Illusionarium, a surreal magical experience and Broadway musical Million Dollar Quartet. The Getaway was built in 2014 with an overall length of 1068.3 ft. and hosts 1,640 crew on board. The Getaway has been voted as the Porthole Magazine’s Best Megaship. The ship set sail on a 7-days Western Caribbean cruise from Miami and is expected to make 22 more calls to Belize between May to December 2016.